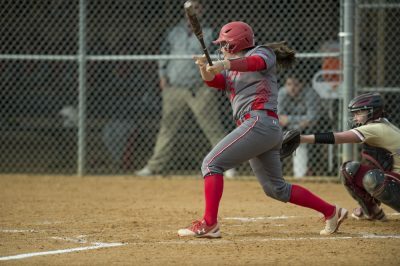 The Boston University softball team has enjoyed a successful beginning to the Patriot League slate with wins in four of its first six conference games against the United States Military Academy and Lehigh University. This weekend, the Terriers (22-17, 4-2 Patriot League) will look to add to that win total against the College of the Holy Cross, which currently sits in sixth place among the seven-team league. The Crusaders (8-21, 2-4 Patriot League) invite BU to town having dropped seven of their last eight games. The lone win came against Central Connecticut State University, which the Terriers swept in a doubleheader Wednesday afternoon. In a contest that lasted nine innings, Holy Cross eked out a 2-0 win on the strength of senior pitcher Katy Watson. The Bexley, Ohio native dealt nine innings of shutdown ball and yielded just eight baserunners while striking out the same amount. The game was decided by the top of the Crusaders order. After junior outfielder Jackie Brewster doubled to begin the ninth inning, she was plated by an RBI single from junior infielder Taylor Wahler. Freshman infielder Bella Jankowski, who went 3-for-4 on the afternoon, provided her team with some insurance with an RBI base knock later in the frame. Brewster and senior infielder Mandy McCarthy are the primary sources of Holy Cross’s run production. Brewster leads the team in batting average by a decent margin, batting .341 while the runner-up in this category, sophomore infielder Sydney Behrens, bats .317. Brewster leads the Crusaders with 14 runs, 31 hits, 10 doubles and 43 total bases. Additionally, she is one of just two batters in the lineup with a slugging percentage above .400, sitting at a mark of .473. McCarthy has also provided Holy Cross with a boost from the No. 3 spot in the order throughout the season. She has accounted for three of the team’s four home runs this season and is first in RBI for the squad with 14. Overall, the Crusaders lineup has batted in just 91 runs this season, the second worst mark in the Patriot League, trumping only Colgate University’s 84. Holy Cross’ four homers are the least in the conference, the team is tied for the least number of walks and its .315 slugging percentage is the third lowest. BU, on the other hand, has hit for the best average in the league (.285), has scored the most runs (174) and has accounted for the most total bases (419). In addition, the Terriers rank first in the Patriot League in doubles (45), second in slugging percentage (.387) and last in total strikeouts (107). Senior outfielder Emma Wong has the highest batting average at .358 for BU while junior infielders Madi Killebrew and Sam Sydenham and junior catcher Alex Heinen are all hitting above a 30 percent mark. With Sunday expected to be damp, the series opener has been shifted to Friday at 4:30 p.m. The two teams will then play two games on Saturday at 12:00 p.m. and 2:00 p.m. Waters emphasized the fact that for her team, improvement is always key.